This Masonic Trapper knife is the perfect gift for the Free Mason in your family. 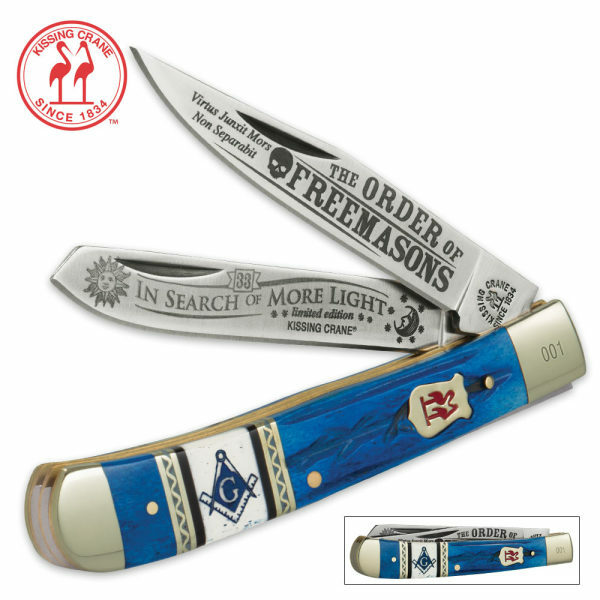 It features the Masonic crest and the blade is etched with complimentary designs. The blades are of rust-resistant stainless steel and the bolsters are of nickel silver. The genuine bone and stone handle is in a vibrant blue. The knife has a 4" closed length. The Kissing Crane Civil War Trapper Knife is a beautiful tribute to the Civl War and is sure to be a family heirloom. 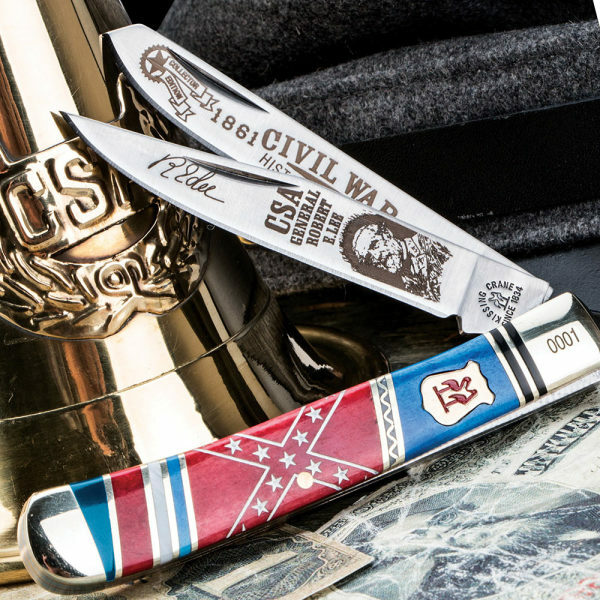 It features a Rebel Flag design and the blade is etched with complimentary designs featuring General Robert E. Lee. The blades are of rust-resistant stainless steel and both the bolsters and liner are of brass. The genuine bone, stone and pearl handle is blue and red, The knife has a 4" closed length. Nickel silver bolsters and brass liner. 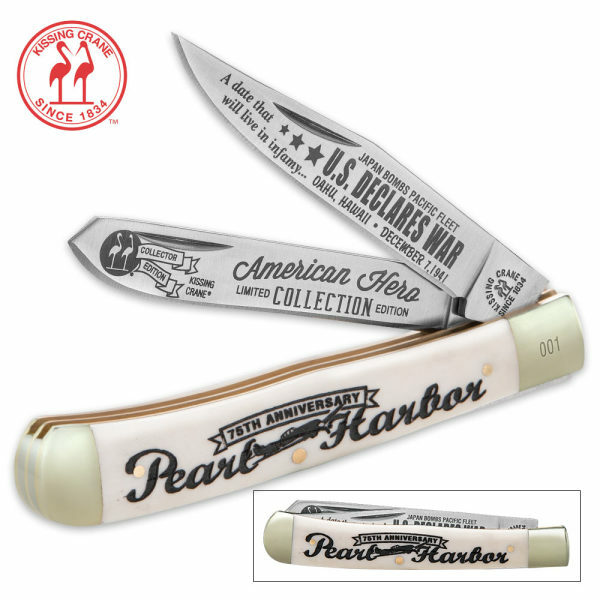 Our hand-crafted Limited Edition Pearl Harbor 75th Anniversary Trapper Pocket Knife from Kissing Crane features original artwork paying tribute to the American Heroes of Pearl Harbor. It has stainless steel blades that are etched with detailed themed messages. The bolsters are of nickel silver and this knife has a brass liner. The Pearl Harbor theme is carried through the white bone handle. It is time to honor the forgotten heroes of Vietnam with this special edition Vietnam Veteran trapper from Kissing Crane! The blades are constructed of 440 stainless steel with commemorative etches. The genuine bone handle features nickel silver bolsters and accents. Each piece is laser serialized and makes a special gift for the forgotten heroes. 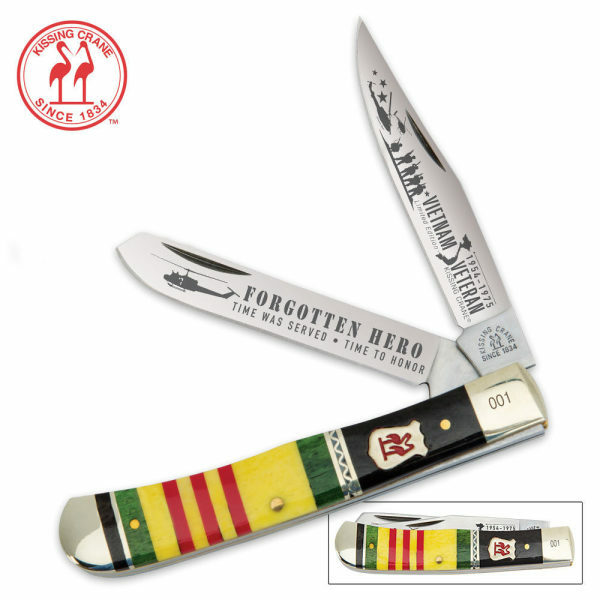 New, in Kissing Crane’s, amazing line of tribute trapper knives, is the USMC themed pocket knife. 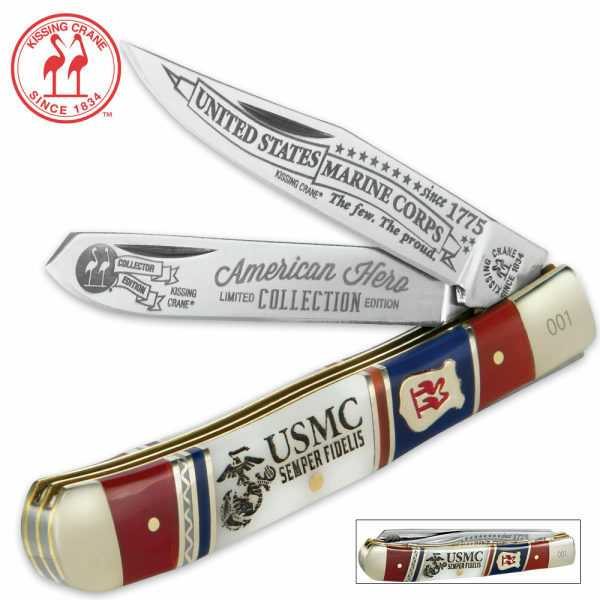 The resin handle, in colors of red, white and blue, has the USMC logo and Semper Fidelis artwork. The stainless steel blades are etched with USMC themes, as well. This folding pocket knife also features shiny nickel silver bolsters and a brass liner. It is 4” closed. Celebrate the Season of Love with the Kissing Crane 2017 Valentine’s Day Trapper. 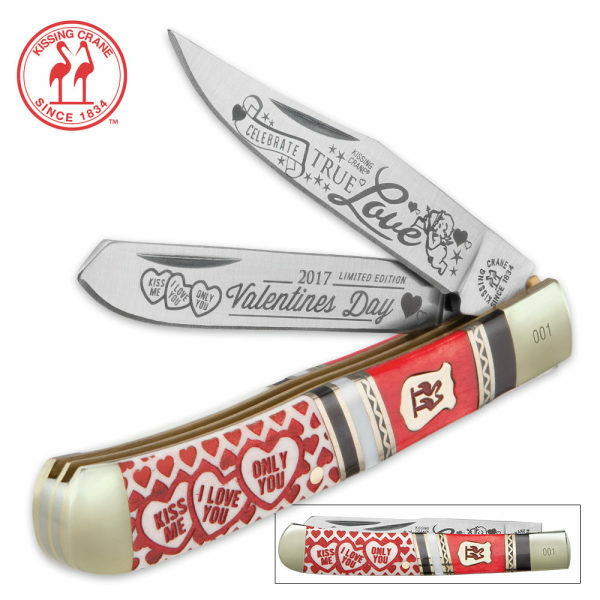 This 2017 limited edition folding pocket knife features razor-sharp 440 stainless steel blades with Valentine’s Day etchings featuring Cupid and hearts. The handsome genuine bone, stone and pearl handle is done in red with black and gold accents and has hearts carved into it. Polished nickel silver bolsters, a brass liner and the classic Kissing Crane cast shield complete this exquisite design. Each one is laser serialized on the bolster. 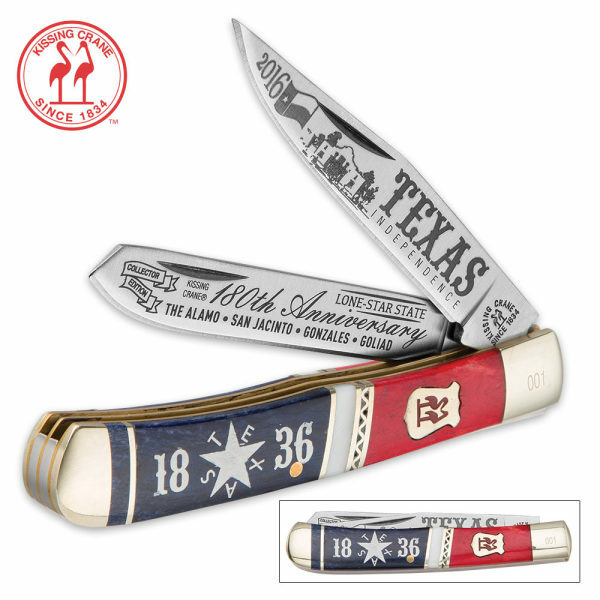 Commemorate the Lone Star State’s independence with the Kissing Crane Texas Independence Trapper Knife. This limited 2016 edition folding pocket knife features razor-sharp 440 stainless steel blades with the 180th Anniversary themed etchings featuring the Alamo. 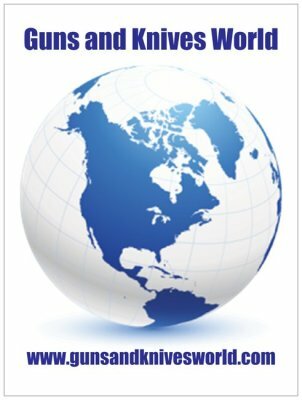 The handsome genuine bone and pearl handle is done in blue and red and has the year of Texas’ independence. Polished nickel silver bolsters, a brass liner and the classic Kissing Crane cast shield complete this exquisite design. Each one is laser serialized on the bolster. The Celtic Pride Trapper Folding Pocket Knife is an exquisite tribute to your Irish heritage. 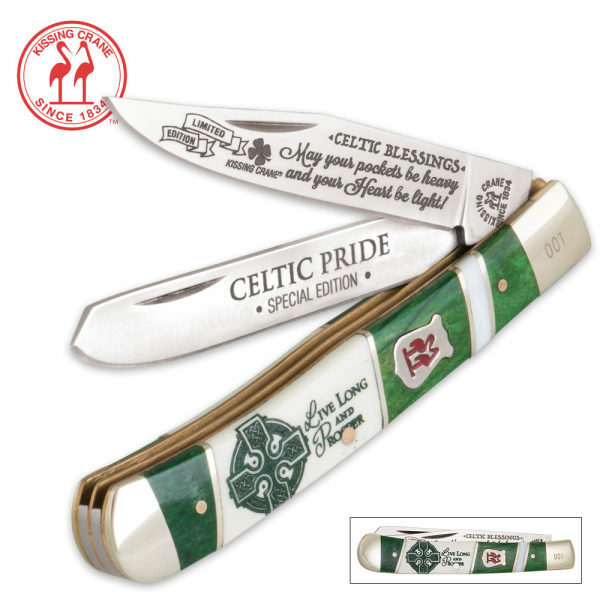 This 2016 limited edition folding pocket knife features razor-sharp 440 stainless steel blades with commemorative Celtic Pride etchings and a handsome genuine bone handle. Polished brass bolsters, pins and accents and the classic Kissing Crane cast shield complete this exquisite design. Each one is laser serialized on the bolster. This Limited Edition Tennessee Whiskey Trapper from Kissing Crane® is perfect for whiskey drinkers and enthusiasts alike! 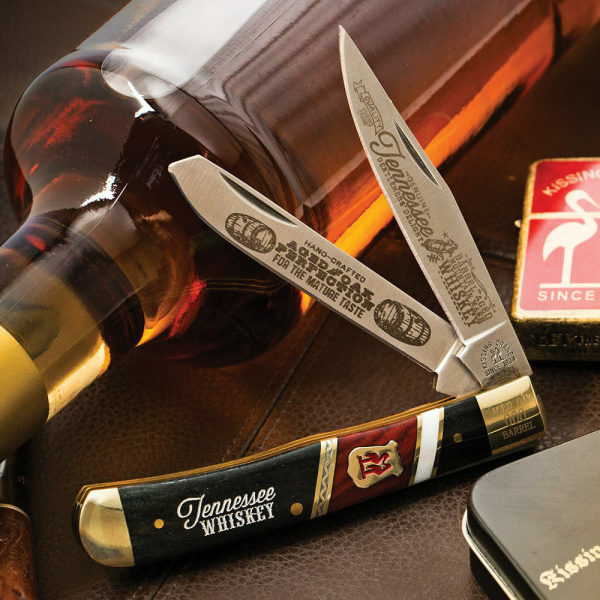 Inspired by the popular barrel aged mountain whiskey produced in the mountains of Tennessee, this trapper will be a unique addition to your pocket knife collection. 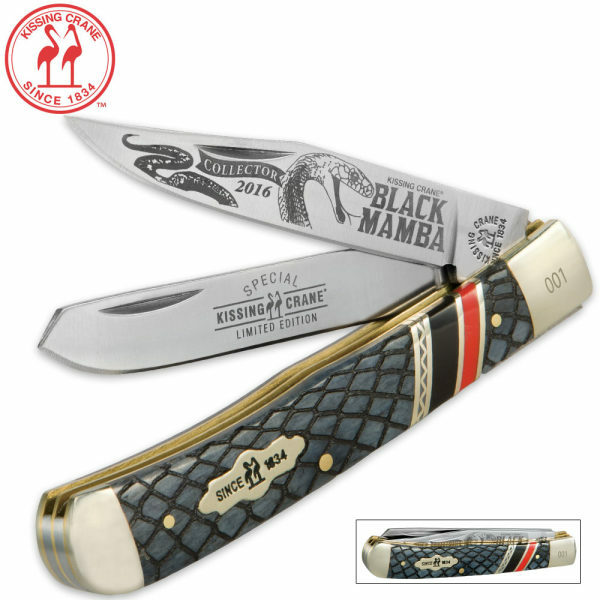 This folder features black and brown bone handle scales, 440 stainless steel blades with commemorative etchings, and brass-plated nickel silver pins and bolsters. Each piece is laser serialized on the bolster. 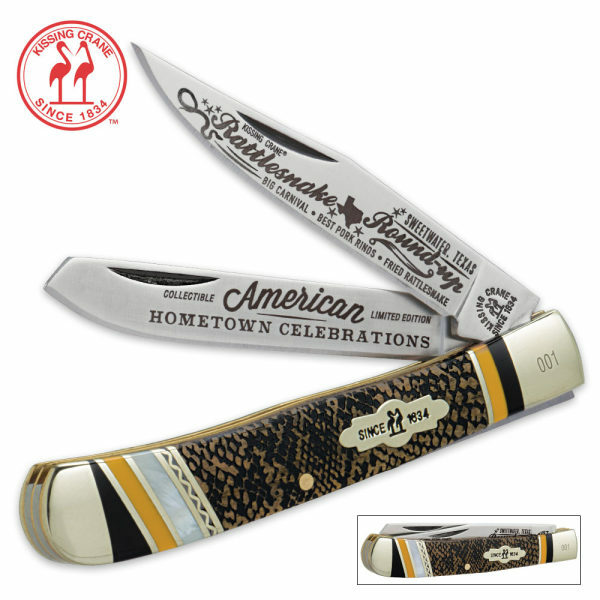 The Rattlesnake Trapper Knife is the newest addition to Kissing Crane's American Hometown Celebrations line. This is a limited edition collectible that pays tribute to the Rattlesnake Roundup in Sweetwater, Texas. The stainless steel blades are etched with designs honoring the event. The bone and stone handle has pearl insets and features a snakeskin texture. This folding pocket knife also features a brass liner and nickel silver bolsters. It is 4" closed. Celebrating one of the most successful pilots of the First World War, the Red Baron, Kissing Crane presents the Red Baron Trapper Knife. 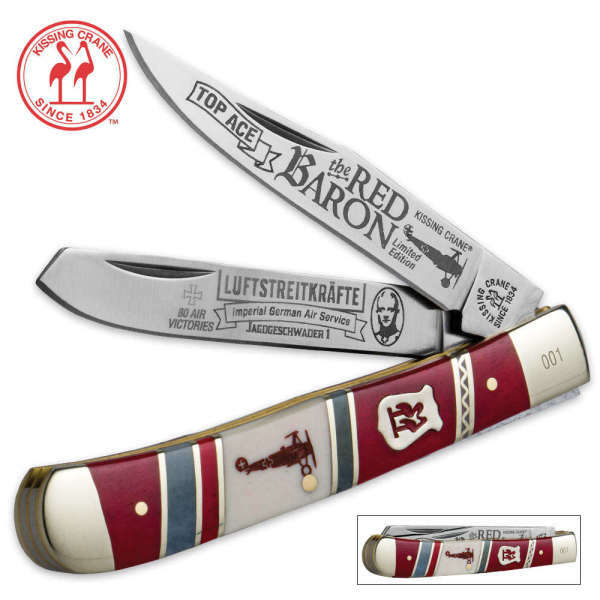 This 2016 limited edition folding pocket knife features razor-sharp 440 stainless steel blades with commemorative Red Baron etchings and a handsome genuine bone handle. Polished brass bolsters, pins and accents and the classic Kissing Crane cast shield complete this exquisite design. Each one is laser serialized on the bolster. There’s nothing like Tennessee Whiskey so Kissing Crane pays tribute to the spirit of these spirits. 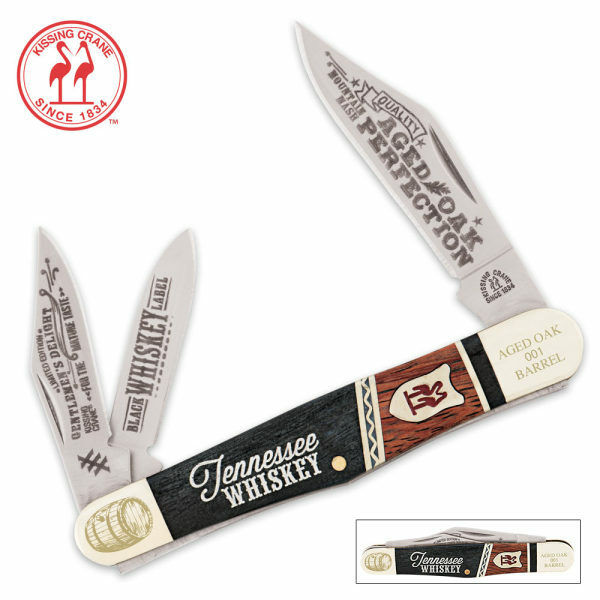 This 2016 limited edition folding pocket knife features razor-sharp 440 stainless steel blades with commemorative Tennessee Whiskey etchings and a handsome genuine bone and rosewood handle. Polished brass bolsters, pins and accents and the classic Kissing Crane cast shield complete this exquisite design. Each one is laser serialized on the bolster.